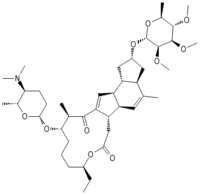 Spinosad is an insecticide based on chemical compounds found in the bacterial species Saccharopolyspora spinosa. The genus Saccharopolyspora was discovered in 1985 in isolates from crushed sugarcane which produce yellowish-pink aerial hyphae, with bead-like chains of spores enclosed in a characteristic hairy sheath. This genus is defined as aerobic, Gram-positive, nonacid-fast actinomycetes with fragmenting substrate mycelium. S. spinosa was isolated from soil collected inside a nonoperational sugar mill rum still in the Virgin Islands. 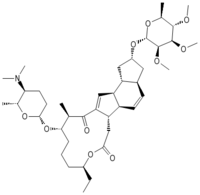 Spinosad is a mixture of chemical compounds in the spinosyn family that has a generalized structure consisting of a unique tetracyclic ring system attached to an amino sugar (D-forosamine) and a neutral sugar (tri-Ο-methyl-L-rhamnose). Spinosad is relatively nonpolar and not easily dissolved in water. Spinosad is a novel mode-of-action insecticide derived from a family of natural products obtained by fermentation of S. spinosa. Spinosyns occur in over 20 natural forms, and over 200 synthetic forms (spinosoids) have been produced in the lab. Spinosad contains a mix of two spinosoids, spinosyn A, the major component, and spinosyn D (the minor component), in a roughly 17:3 ratio. Spinosad is highly active, by both contact and ingestion, in numerous insect species. Its overall protective effect varies with insect species and life stage. It affects certain species only in the adult stage, but can affect other species at more than one life stage. The species subject to very high rates of mortality as larvae, but not as adults, may gradually be controlled through sustained larval mortality. The mode of action of spinosoid insecticides is by a neural mechanism. The spinosyns and spinosoids have a novel mode of action, primarily targeting binding sites on nicotinic acetylcholine receptors (nAChRs) of the insect nervous system that are distinct from those at which other insecticides have their activity. Spinosoid binding leads to disruption of acetylcholine neurotransmission. Spinosad also has secondary effects as a Ɣ-amino-butyric acid (GABA) neurotransmitter agonist. It kills insects by hyperexcitation of the insect nervous system. Spinosad so far has proven not to cause cross-resistance to any other known insecticide. Spinosad has been used around the world for the control of a variety of insect pests, including Lepidoptera, Diptera, Thysanoptera, Coleoptera, Orthoptera, and Hymenoptera, and many others. It was first registered as a pesticide in the United States for use on crops in 1997. Its labeled use rate is set at 1 ppm (1 mg a.i./kg of grain) and its maximum residue limit (MRL) or tolerance is set at 1.5 ppm. Spinosad’s widespread commercial launch was deferred, awaiting final MRL or tolerance approvals in a few remaining grain-importing countries. It is considered a natural product, thus is approved for use in organic agriculture by numerous nations. Two other uses for spinosad are for pets and humans. Spinosad has recently been used in oral preparations to treat C. felis, the cat flea, in canines and felines; the optimal dose set for canines is reported to be 30 mg/kg. Trade names include Comfortis and Trifexis (which also includes milbemycin oxime) (both brands treat adult fleas on pets; the latter also prevents heartworm disease), and Natroba (for human head lice). It is commonly used to kill thrips. Spinosyn A does not appear to interact directly with known insecticidal-relevant target sites, but rather acts via a novel mechanism. Spinosyn A resembles a GABA antagonist and is comparable to the effect of avermectin on insect neurons. Spinosyn A is highly active against neonate larvae of the tobacco budworm, Heliothis virescens, and is slightly more biologically active than spinosyn D. In general, spinosyns possessing a methyl group at C6 (spinosyn D-related analogs) tend to be more active and less affected by changes in the rest of the molecule. Spinosyn A is slow to penetrate to the internal fluids of larvae; it is also poorly metabolized once it enters the insect. The apparent lack of spinosyn A metabolism may contribute to its high level of activity, and may compensate for the slow rate of penetration. Spinosad has high efficacy, a broad insect pest spectrum, low mammalian toxicity, and a good environmental profile, a unique feature of the insecticide compared to others currently used for the protection of grain products. It is regarded as natural product-based, and approved for use in organic agriculture by numerous national and international certifications. Spinosad residues are highly stable on grains stored in bins, with protection ranging from 6 months to 2 years. in honeybee (Apis mellifera Linnaeus, 1758), LD50=0.0025 mg/bee (highly toxic for 30 days, lethal to egg stage, lethal to larval stage, and causes subsequent queen death; it appears to kill sperm, therefore queens are rendered useless and are soon replaced if the hive survives). Even dried residues have been observed to be lethal to honeybee colonies, whereby honeybees may take up residues from dried sprays in dew which may form on sprayed fruit, foliage, etc. Of 12 hives which were so affected in western Massachusetts in the first week of June, 2015, only two were considered strong when heading into winter, whereas four hives collapsed outright. None of the affected hives was expected to winter over successfully. 1 2 Mertz, Frederick; Raymond C. Yao (Jan 1990). "Saccharopolyspora spinosa sp. nov. Isolated from soil Collected in a Sugar Mill Rum Still". International Journal of Systematic Bacteriology. 40 (1): 34–39. doi:10.1099/00207713-40-1-34. 1 2 3 4 5 Qiao, Meihua; Daniel E. Snyder; Jeffery Meyer; Alan G. Zimmerman; Meihau Qiao; Sonya J. Gissendanner; Larry R. Cruthers; Robyn L. Slone; Davide R. Young (12 September 2007). "Preliminary Studies on the effectiveness of the novel pulicide, spinosad, for the treatment and control of fleas on dogs". Veterinary Parasitology: 345–351. doi:10.1016/j.vetpar.2007.09.011. 1 2 Watson, Gerald (31 May 2001). "Actions of Insecticidal Spinosyns on gama-Aminobutyric Acid Responses for Small-Diameter Cockroach Neurons". Pesticide Biochemistry and Physiology. 71: 20–28. doi:10.1006/pest.2001.2559. 1 2 3 4 5 Hertlein, Mark; Gary D. Thompson; Bhadriraju Subramanyam; Christos G. Athanassiou (12 January 2011). "Spinosad: A new natural product for stored grain protection". stored products. 47: 131–146. doi:10.1016/j.jspr.2011.01.004. Retrieved 3 May 2012. 1 2 Orr, Nailah; Andrew J. Shaffner; Kimberly Richey; Gary D. Crouse (30 April 2009). "Novel mode of action of spinosad: Receptor binding studies demonstrating lack of interaction with known insecticidal target sites". Pesticide Biochemistry and Physiology. 95: 1–5. doi:10.1016/j.pestbp.2009.04.009. 1 2 3 Sparks, Thomas; James E. Dripps; Gerald B Watson; Doris Paroonagian (6 November 2012). "Resistance and cross-resistance to the spinosyns- A review and analysis". Pesticide Biochemistry and Physiology: 1–10. Retrieved 17 November 2011. ↑ "Spinosad - brand name list from". Drugs.com. Retrieved 2012-10-20. ↑ "UC Davis School of Vet Med:". Vetmed.ucdavis.edu. Retrieved 2012-10-20. ↑ "Safer Flea Control | Insects in the City". Citybugs.tamu.edu. Retrieved 2012-10-20. ↑ "Codling Moth and Leafroller Control Using Chemicals" (PDF). Entomology.tfrec.wsu.edu. Retrieved 2012-10-20. ↑ S.A. Mansour, A.H. Mossa & T.M. Heikal, 2008, Cytogenetic and hormonal alteration in rats exposed to recommended “safe doses” of spinosad and malathion insecticides. Int. J. Agri. Biol. 10: 9–14, see , accessed 3 June 2014. ↑ "Spinosad Insecticide: Subchronic and Chronic Toxicity and Lack of Carcinogenicity in CD-1 Mice". Toxsci.oxfordjournals.org. Retrieved 2015-03-08. ↑ "Spinosad Insecticide: Subchronic and Chronic Toxicity and Lack of Carcinogenicity in Fischer 344 Rats". Toxsci.oxfordjournals.org. Retrieved 2015-03-08.